In 1791, James Power, originally a coaching innkeeper of Thomas Street in Dublin, established the “John’s Lane Distillery” at Thomas St. in Dublin. Originally called “James Powers & Son”, by 1809 the business had become a limited company under the name of “John Power and Son” with the father remaining in charge. The business continued to grow successfully and by 1823, Power’s distillery boasted a 500 gallon still with an annual output of some 33,000 gallons of whiskey per year! This success had it benefits for a family that within a generation rose from simple innkeepers to members of Dublin’s high society. John Power was knighted and became High Sheriff of Dublin. Such was his standing that it was he who laid the foundation stone for the O’Connell Monument on O’Connell Street – Dublin’s main thoroughfare. By 1866, John Power & Son began bottling their own whiskey, becoming one of the first distilleries in the world to do so. Until then, distilleries usually sold whiskey by the cask (opposite). 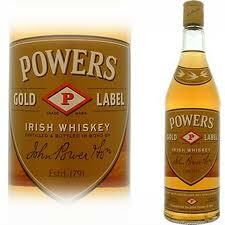 A gold label adorned each bottle and it was from these that the whiskey got the name Powers Gold Label. Check out their website here and have a “small wan” the next time it get’s cold out ! Also you can read more about the fascinating Power’s Whiskey story from this document – an extract from Thom’s Almanac in the late 1800s.